SB20 Band Sealer | PAK Automation Ltd. The Supersealer SB20 Rotary Band Sealer is the ultimate bandsealer. With its Stainless Steel finish it is clean and durable, preferred in food and other industries. The heavy duty stainless steel construction, in combination with proven band sealing technology, and operator friendly controls, ensures continuous duty performance in demanding applications. 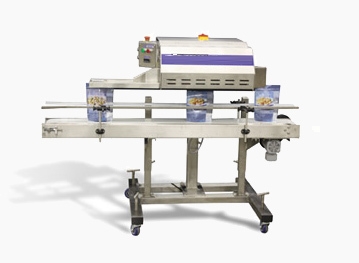 The band sealer can be equipped with Crank Stands, Bag coders and printers, Bag support conveyors, Bag top trimmers/trim removers and Scales and Auger fillers. Bag range material: Sealable up to 12 mill. Power: 110 VAC 1 Ph, 60 Hz, 10 Amp. Stainless Steel finish: Clean and durable.